Scientists are closing in on a whole new way of understanding the importance of glaciers. The scientific study of glaciers first got its footing in the late 1700s, and many of the basic ideas proposed in the following century still hold. But though scientists have learned much about glaciers—how they grind the Earth and reshape the land; how they provide water for millions of people; and, more recently, how their steady retreat is causing oceans to rise—scientists have also long overlooked one of glaciers’ most important roles: how they affect the chemistry and biology of downstream environments. Glaciers are more than just rivers of ice, says biogeochemist Eran Hood. They’re complex ecosystems packed with algae, microbes, carbon, iron, and other nutrients. And as they melt, those organic elements are deposited into the rivers, estuaries, and oceans below. Yet until recently, the question of how glacier runoff affects life downstream has received little, if any, attention. “Glaciologists are obsessed with glaciers,” says Hood. “Fisheries biologists are obsessed with fish. Everyone’s looking at their own little piece without looking at the larger connections.” Now, Hood is at the center of an interdisciplinary team of scientists working to bridge the gap. And the campus where he works offers the perfect place to begin piecing together the puzzle. The University of Alaska’s Juneau campus is surrounded by the Tongass National Forest, a rainforest archipelago of moss-draped trees, foggy ocean passages, and teal-veined glaciers. Rates of glacial melt here are among the highest on Earth. By the end of the century, up to 36 percent of southern Alaska’s glaciers could disappear into the sea, one drop at a time. All that runoff may translate into big effects downstream. In the Herbert River outside Juneau, for example, Hood and his colleagues found that at the height of glacial runoff season, 36 percent of the carbon gobbled up by juvenile salmon comes from upstream glaciers. Further north in Kenai Fjords, another research team discovered that glaciers enhance primary productivity by upping the production of phytoplankton—a key part of the marine food web. So will greater glacial runoff lead to bigger salmon runs and increased biologic productivity? Hood cautions that it’s too soon to make sweeping predictions. But in the near term, researchers expect that ecosystems from Patagonia to New Zealand will indeed see a greater influx of nutrient-rich freshwater. Globally, the carbon deposited by glaciers into oceans is expected to be 48 million tonnes by 2050, or 1.5 times the annual carbon runoff from the Amazon River. A third of that can be attributed specifically to glacial recession. In the long run, though, the flow of natural fertilizer will likely taper off, leading to difficult-to-predict changes in marine chemistry and food webs. Some scientists hypothesize that species adapted to cold, turbid conditions like the Kittlitz’s murrelet, a speckled black-and-white seabird whose numbers have decreased by 85 percent over the past three decades, may continue to suffer, while species that prefer warmer water, like walleye pollock, may thrive. The changes won’t be confined to Alaska’s panhandle, either. Thanks to the swirls and pulses of the Alaska Coastal Current, glacier-fed streams and rivers from the state’s southern coast serve as the primary source of freshwater to the Bering Sea. At the southern curve of the current, glaciers grind the earth, picking up iron, phosphorous, carbon, and other nutrients. Then, they release those nutrients into the sea, and as if stirred by a giant spoon, the water swirls clockwise to the north, possibly impacting ecosystems some 3,000 kilometers away on the edge of the Arctic. Though the data spooling from this new field of inquiry are already being anticipated by fishermen, public land managers, and the scientific community, Hood and his colleagues are just beginning to connect the dots. We have, so to speak, only revealed the tip of the iceberg. 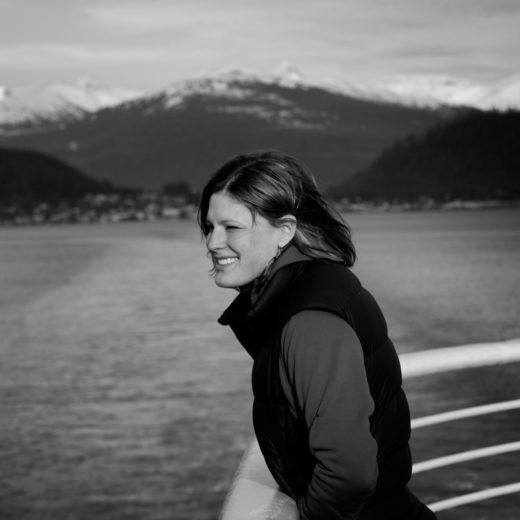 Cite this Article: Krista Langlois “Glacier-Fed Life,” Hakai Magazine, Apr 27, 2015, accessed April 23rd, 2019, https://www.hakaimagazine.com/news/glacier-fed-life/.